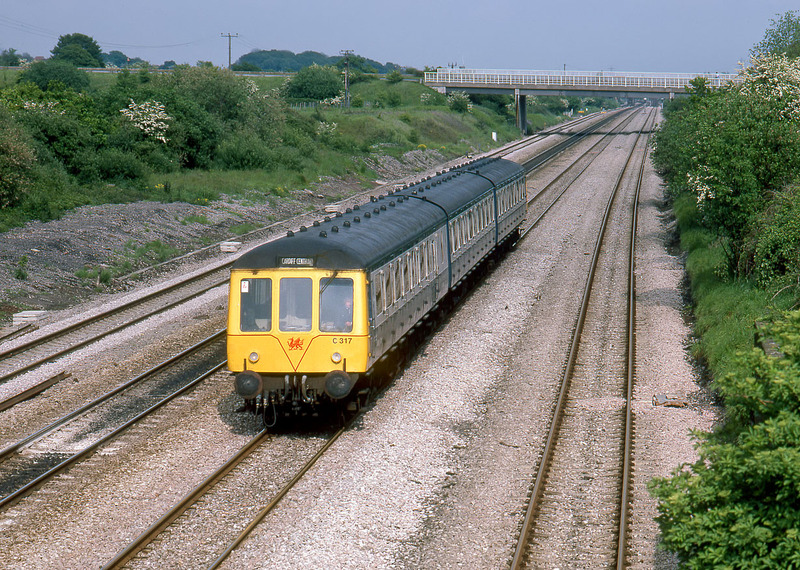 C317 (53858, 59446 & 53911) passes Llandevenny on 23 May 1987 with the 16:54 Chepstow to Cardiff Central service. Set C317 was disbanded in October 1989, with the two driving vehicles being scrapped at Vic Berry's, Leicester during the following year. The centre trailer survived a little longer, being finally withdrawn in June 1993 and almost immediately disposed off at MC Metals, Glasgow. The unit carries the Welsh red dragon logo and minimalist red speed whiskers, so common on Welsh units at the time.